Many of the comments at the bottom of my guides for dual booting Windows 10 with Ubuntu relate to the use of SSDs. In this guide I am going to show you how I dual booted Ubuntu and Windows 10 on my Lenovo Y700 Ideapad which contains a 128 gigabyte SSD and a 1 terabyte hard drive. I have dedicated a whole new post for this guide as there is enough information to warrant it but there are links to other guides for areas that cross over. I always start with this option because you need to know that you can get back to where you started should something go awry. Follow this guide which shows the safest way to back up Windows 10. 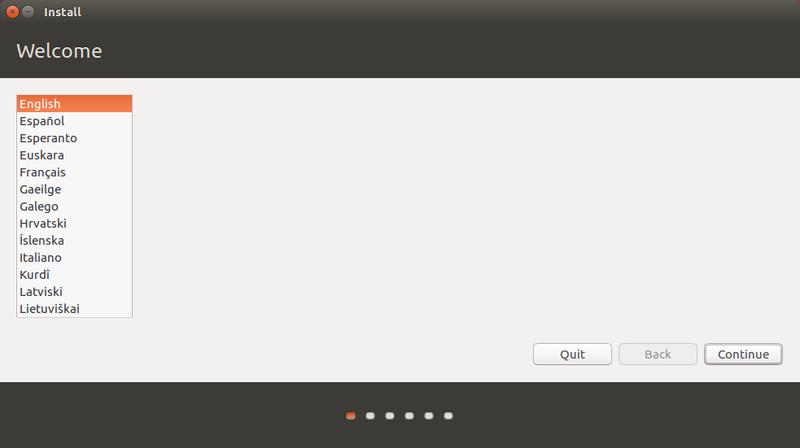 In order to install Ubuntu you will need a bootable Ubuntu USB drive. You can either follow this guide which shows how to create a USB drive using Win32 Disk Imager or you can purchase a Ubuntu USB drive from here. This is where the major part of the guide differs from the previous one. Right click on the start button and when the menu appears choose “Disk Management”. The image above shows how the disks on my laptop were partitioned prior to me changing them. Quite frankly they are ridiculous and I suspect other people who have bought laptops also have poorly thought out installations by the manufacturers. Disk 0 represents the 128 gigabyte SSD and Disk 1 represents the 1 gigabyte hard drive. So Why is this disk layout ridiculous? The best performance you will get is when you are reading from the SSD. There are 2 recovery partitions installed on that very same SSD. The whole point of recovery partitions is that they sit out of the way and are only read when you are up a creek without a paddle. Therefore there is over 20 gigabytes of SSD totally wasted. There is also a recovery area on the hard drive which takes up over 70 gigabytes. I think it is sensible to have recovery partitions on the hard drive as although they waste space they are wasting space on the drive you want to use least. I use Windows very infrequently so I don’t need the Windows recovery partitions. I therefore decided to get rid of the Windows recovery partitions and keep the 1 gigabyte OEM partition and the recovery partition on the hard drive. This means I can always do a factory restore. (I have Windows 10 on a USB drive so there really isn’t any need for me to keep this really either). To remove the recovery partitions I opened an administrators command prompt by right clicking on the start button and choosing “Command Prompt (Admin)” from the menu. The command line tool I used is called diskpart. To run diskpart simply type diskpart into the command window. You can view the disks on the computer by typing list disk. From the image above you will see that disk 0 and disk 1 were returned. The disk I wanted to work on was disk 0 which is the SSD. To select the disk you wish to amend type select disk n where n is the number of the disk. To see the partitions on a disk type list partition. As you can see I have 6 partitions listed. I wanted to remove partition 4 and partition 5 which were the recovery partitions. To select a partition the command to use is select partition n where n is the number of the partition. Normally to delete a partition all you have to do is type delete partition. Recovery partitions are special though and are protected from deletion. You can force the deletion of the partition by typing delete partition override. The above image shows my disk after removing the recovery partitions. Now 20 gigabytes is just about enough for Ubuntu but I wanted more so I reduced the size of the Windows partition as follows. To shrink a partition right click on it and choose “Shrink Volume” from the menu. A window will appear and it will show you how much you can afford to shrink Windows by. You can choose less than the amount specified but never more. When you feel you have enough space click “Shrink”. I went for the default option. As you can see I now have nearly 60 gigabytes free for installing Ubuntu to on the SSD. To be able to boot into Ubuntu you will need to adjust the power options so that your computer can boot from the USB drive. Right click on the start button and choose “Power Options”. From the menu click on the option “Choose what the power option does”. At the top of the screen you will see a link with the words “Change settings that are currently unavailable”. Now scroll down and make sure the “Turn on fast startup” does not have tick in it. If it does click on it until it doesn’t. To boot into Ubuntu hold down the shift key whilst logged into Windows. Reboot the computer whilst holding down the shift key. A window will appear with UEFI boot settings. Choose to boot from an external device and choose boot from EFI device. 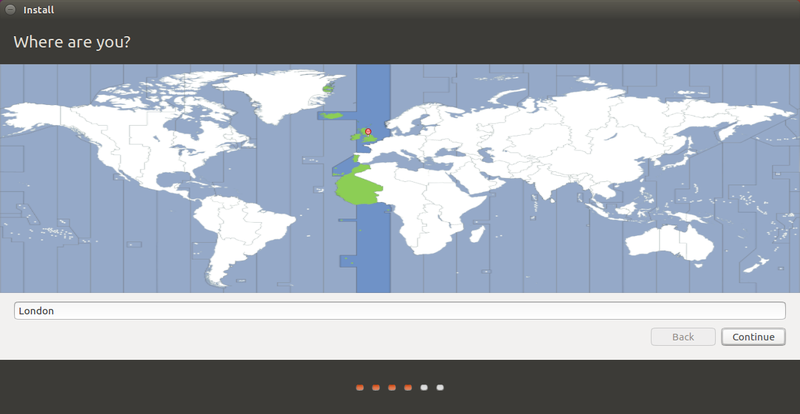 You should now boot into a live session of Ubuntu. If you want to be able to install updates during the installation click on the network icon in the top right corner and choose your wireless network. Enter the security key when requested. If you are happy to wait until after the installation before installing updates do not worry about connecting to the internet. If you have a poor internet connection I recommend not installing updates until after the installation has completed. Double click on the install icon on the desktop. The above welcome message should appear. Choose your installation language and click “Continue”. If you haven’t connected to the internet then the download updates option will be greyed out but if you have connected you can choose to download updates. Also on this screen you can choose to install third party codecs which make it possible to play MP3 audio. Note the option that says that you need to turn off secure boot to install the codecs. It is actually easier to not install codecs now and do it post installation whereby you won’t have to do anything with secure boot. Rather strangely I was asked whether I wanted to unmount the SSD before installing. I clicked “No” to this option. Normally at this stage I would say to choose the “Install Ubuntu alongside Windows Boot Manager” option but because I want to show how to partition the drive manually I suggest using the “Something Else” option. This allows you to specify where each partition is located. The next screen shows the layout of your disks. In my case there are partitions on /dev/sda and /dev/sdb. What you are looking for is the free/unallocated space on /dev/sda which is the SSD and free/unallocated space on /dev/sdb which is the hard drive. 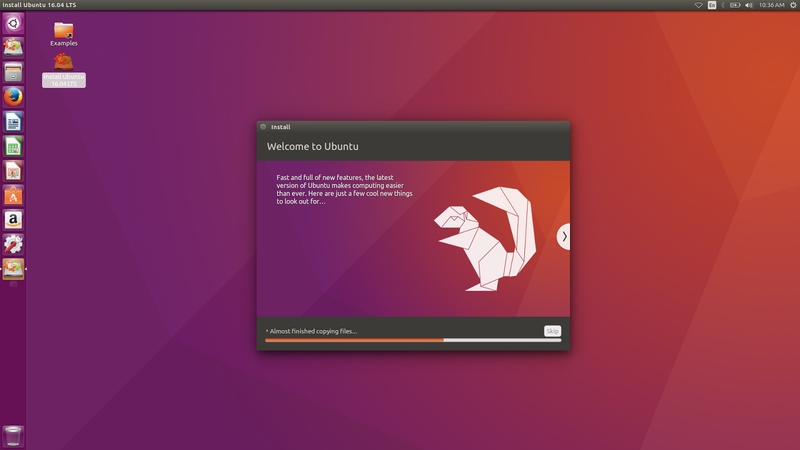 I chose to go for a full install of Ubuntu on the SSD as I will be using this regularly. I also decided to create a swap partition although with 16 gigabytes of RAM this is probably wasted disk space. I therefore put the swap partition on the hard drive. 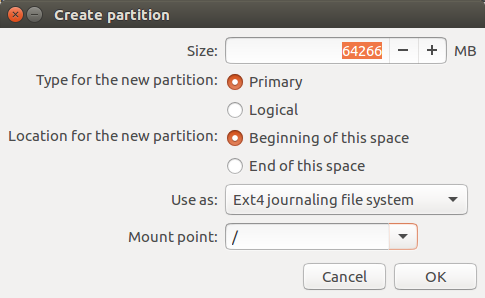 To create a partition click on the free space on /dev/sda and press the plus symbol. For the size I chose the whole of the space on the SSD. It is a primary partition and I want to use the beginning of the space (although it doesn’t really matter because I am choosing all the space). I chose EXT4 as the file system and / as the mount point. Clicking OK creates the partition and returns you to the disk layout screen. With the SSD now completely allocated I moved on to the hard drive. 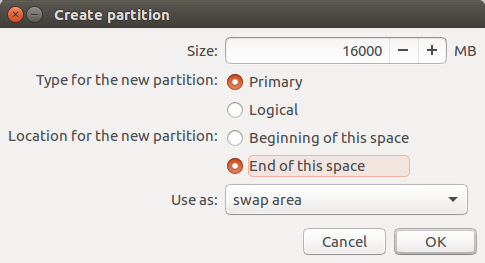 To create a swap partition I clicked on the free space on /dev/sdb and press the button with the plus symbol again. I went for the full 16 gigabytes to match the amount of RAM in my machine. This is severely overkill but as I wasn’t limited for disk space I went for it anyway. Again I set the partition to primary but note that I chose to use the end of the space. In theory as this should be hardly used moving it to the end of the disk seems a sensible idea. The only other thing to note is that I set the use as drop down list to “swap area”. Clicking OK takes me back to the disk layout screen. The rest of the hard drive is still an empty block of free space so what should I do with it? I chose to create a 50 gigabyte FAT32 partition which gives me a nice area to share files between Linux and Windows without worrying about one not being overly happy with NTFS and the other not being at all happy with EXT4. The rest I partitioned as a large block of space as an EXT4 partition. This is where I will store all of my larger files that I won’t use regularly. Things like movies would fit well into this space. Note that for these partitions I didn’t choose a mount point. I did that later on in the Ubuntu disks tool as it is more user friendly. With both of the disks now fully allocated I clicked the “Install Now” button. A message appears showing the partitions that will be created. Just continue past this screen. The rest of the installation is fairly ordinary. Select where you live by clicking on the map. This will set the time correctly on your computer. Choose your keyboard layout by selecting the language in the left pane and the layout in the right pane. Finally create a user. Enter your name and a name for your computer. 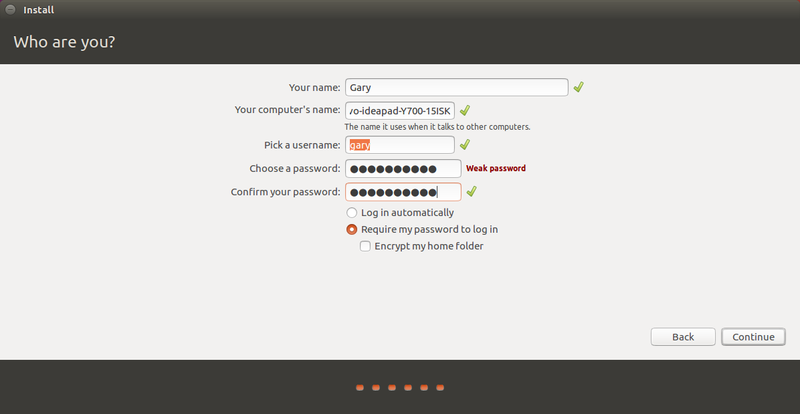 Then enter a user name and choose a password and repeat it. By default the setup requires you to log in every time you boot but you can get your computer to log in automatically by selecting the option but I don’t recommend this. The files will now be copied across and the system will be installed. Finally you will be asked whether you want to continue testing or restart now. You can try rebooting and if the computer boots straight to Windows reinsert the USB drive and hold down the shift key and reboot back to the UEFI boot screen as you did before to get into the live version of Ubuntu. Then follow this guide which shows how to use EFI Boot Manager to change the boot order. When you have finished it is worth following this guide which shows 33 things to do after installing Ubuntu. Also check out my new guide which shows how to show common applications such as Chrome, Dropbox and Steam easily in Ubuntu. I am not saying my way is the only way to format the SSD and I welcome comments and suggestions in regards to this area. The current layout is working well for me however. If Ubuntu still will not boot after running EFI Boot Manager try reading this guide which aims to help with UEFI boot issues. How to understand UEFI boot settings. "The partition table format in use on your disks normally requires you to create a separate partition for boot loader code. This partition should be marked for use as a "Reserved BIOS boot area" and should be at least 1MB in size. Note that this is not the same as a partition mounted on /boot." I tried to install ubunto 16.04 on my new asus laptop, which has 256G SSD with windows10 on it, and 1TB HDD empty. I followed step by step through this instruction (by using both an USB boot disk and DVD boot disc), but after I selected "install ubunto" from the list of options right after booting up, then little ubuntu logo showed up in the middle of the screen with dots moving around underneath. Then the dots stopped moving and stuck. Any idea ? hints ? A little more information on my previous question, the disk numeration is disk 0 being the 1TB HDD, disk 1 is the SSD drive with the windows10 OS on it. And disk 1 is the place I want to install linux, but I was stuck before I get there to select drive and partition. "Note that for these partitions I didn't choose a mount point. I did that later on in the Ubuntu disks tool as it is more user friendly." Do you have a posting regarding this process please? I assume that you are placing any home directories onto the hard drive, and was expecting this to be done when the hard drive ext4 partition was made. I suspect that you are creating symbolic links, but would be grateful for further enlightenment. Really helpful. I am an old school Linus user for many years. I just bought a new Alienware with WIn10 preloaded and am new to SSD drives as well. It's really not all that difficult to figure out… but that being said, I prefer to read up on things before I go changing a very expensive laptops configs. Thank you very much for the article. It really helped. Hi. I think it needs to be said right at the beginning that this procedure works with UEFI and GPT partitioned disks. Older Standard BIOS and MBR partitioned disks, have a limit of 4 partitions, (unless you have extended partitions) which tend to get eaten up by all the boot, swap, Windows and Linux partitions. GPT is wonderful in that regard. Also note that Windows 10 (at least in MBR mode) now leaves its disks in an unsafe mode, due to Fastboot (caching) and hibernation (caching) that don't clear down their caches coherently. So Linux won't 'see' NTFS/FAT files. I switch these off in Windows, and use Write-caching (and a third party caching software) that behaves properly on shutdown, so the Windows10 partitions now mount in Linux. Hope this helps. Hi, thanks for your guide. But my situation is a bit different, because I have only 24GB SSD which is built in and 1TB hard drive, is it possible to let me install Ubuntu on 24GB SSD while Windows 10 on 1TB hard drive? Any disadvantages or conflict by doing this? Thanks so much in advance. Unknown (on 29/07/2016 @ 12:14), that 24GB SSD is likely a cache drive, used by Intel Rapid Storage Technology. This space is kind of like 'hybrid' HDD's that has a 8-16GB Flash storage to speed up the drive when using your most frequently ran apps (including browsers, MS Office & more). However on a computer that shipped with a 128GB SSD, or was added after purchase, the smaller cache (pronounced 'CASH') drive will actually slow the SSD & it become really noticeable when disabled, which I had to on one notebook after upgrading to a SSD, and the 8GB cache drive was of the iSSD (or eMMC) type. It stood no chance of speeding up a 256GB Crucial M550, which I noticed immediately it was running slower than normal after cloning. The 8GB iSSD was crippling the speed to near SATA-2 levels. No wonder why Samsung exited the Windows computer market, however they still have a large presence, in just 4 years have rose from the ashes in the field to being the #1 most desired consumer based SSD's, and they manufacture RAM & other components for large OEM's, such as Dell, HP, Lenovo & others. While most of Samsung's ventures becomes liquid gold, not so with buggy firmware & inferior components targeting Mac owners of all users. While they know price, they also know quality, there's a huge difference between cheap plastic & aluminum/magnesium cases & keyboards on their computers, including their AIO series line of Mac PC's. This is one of the reasons why Mac owners stick with the brand, even with lower specs, is build quality. With some computers that SSD can be formatted & Ubuntu installed on (if mSATA or M.2 SSD), though if on a notebook & it's a 'iSSD' or 'eMMC' SSD chip soldered to the MB, then no that can't be done. It can only be used for it's intended purpose. One advantage you have if that drive is removable, is to uninstall & upgrade to a larger one (a 250-256GB one is reasonably priced), and if M.2, chances are great that it'll outrun the SATA-3 SSD already onboard. This is because generally speaking, the 250-512GB versions are faster, over 500MB/sec reads & writes, whereas the 128GB versions are often limited to just over 400MB/sec writes & close to or just over 500MB/sec read speeds. Many finds 250-256GB models to be the 'sweet spot', because normally with a Data drive already installed, it's all that's needed, and the cost is much better (usually $100 or less for most models). The 500-512GB models normally has little to no increased speed, yet since it has a larger work area, will wear better, one of the few things in it's favor. At any rate, backup your SSD, and in the UEFI BIOS, there's often an option to change from IRST to AHCI. If not, check out the specs of the computer to disable the cache. So far so Good, I've got ubuntu installed and running alongside my windows. Thanks you for a brilliant tutorial! I'm trying to figure out how to install ubuntu 16.04 on a HP EliteBook 840 G1 running Windows 10. "Even if UEFI, Arch Linux and (e.g.) GRUB are correctly configured and with the correct UEFI NVRAM variables set, the system will not boot from the HDD/SSD. The problem is that HP hard coded the paths for the OS boot manager in their UEFI boot manager to EFIMicrosoftBootbootmgfw.efi to boot Microsoft Windows, regardless of how the UEFI NVRAM variables are changed." Always verify the correct path to the .efi file. Also, adjust the device boot order (also in the UEFI pre-boot graphical environment) to boot this entry first." Does the above installation tutorial address this, or is this something that needs to be done in addition to the tutorial presented? I would like to know how to install ubuntu in my second hard drive. I will rarely use ubuntu and I would like to have it in my 1TB hard drive instead of in my 128GB SSD. Do you know how to do it? I have already created an Ubuntu 16.04 USB drive and powered off fast startup, shrinked space from the hard drive to allocate Ubuntu… but when I plug the USB drive and restart the PC holding the shift key no Ubuntu appears when I choose the Use a device option. Hello, I only want to know why do you need to turn off 'fast startup' in a SSD disk. Thanks you in advance. Unable to install ubuntu with winodws 10. Dell xps 15. 512 SSD. When i try to install with bootable usb, it tried to install ubuntu to the usb itself. other partitions are not mounted/shown. So i cannot see the screen where we select the installation options of choosing the drive. any help? I have the same issue. I am not able to see the partition available for install and no installation type displays on the list. Hi, I'm trying to do this to install ubuntu but when I go into disk management in windows 10 and I right click on Windows (C:), all that shows up is "Help" and nothing else. Do you have any idea to fix this? I have lenovo ideapad 100-15IBD with 128Gb SSD. I first installed Windows 10 and it took about 80Gb of space, then i installed Ubuntu 16.04.1 LTS on 3 partitions (1 for swap (8Gb),1 for root,and 1 biosgrub partition (5Mb)). On device for boot loader installation i selected sda5 wich is root partition. Now when i start computer i can't enter Ubuntu, i can only enter Windows.Do you know what it is the problem and where should i put device for boot loader installation, on what partition? Hey, thanks for this great guide. I have a Dell Inspiron 7559 laptop I just did this with. Everything installed ok, and I am able to choose whether I boot to Windows 10 or Ubuntu 16.04 with GNU Grub on startup. However, I get some unusual messages when I switch from one OS to the other I'm not sure if I should be concerned or not. After getting a lot of the CPU stuck messages and other messages similar to these, the computer wont shut down and I have to hard boot it. When I start Windows after running Ubuntu, I get a message during startup: "To skip disk checking, press any key with 8 seconds." "Scanning and repairing drive (E:)"
E: is the FAT32 partition I set up during Ubuntu installation, per your guide. I gave it 10GB. Is this something I should be worried about? Anything I can do to fix it? Any insight is appreciated. Thanks very much! if you don't change the default and install it on sda1Windows Boot Manager, will it change the existing bootloader or install next to it? 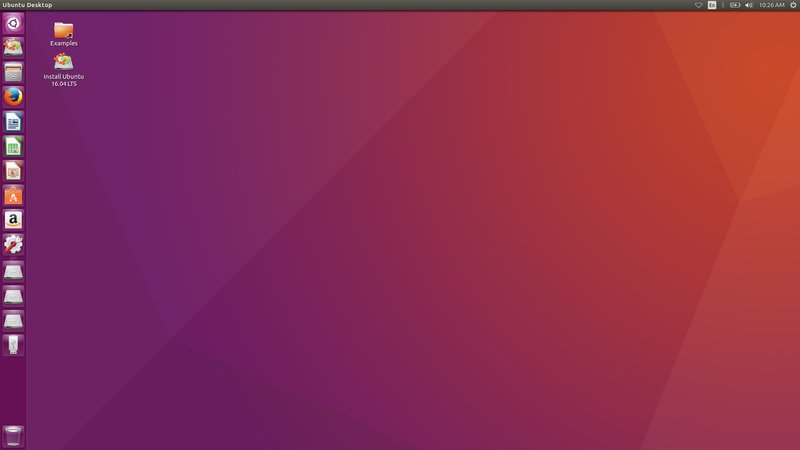 i want to be able to boot to both Windows and Ubuntu without the annoying grub menu, which is also very buggy. I also have a Y700. I do not have an option of USB boot in my Boot Option menu. Could you please help me this issue? Only option I have is EFI PXE Network. 1) I heard that swap is unnecessary and in fact harmful when using SSDs as the increased read-write processes will shorten their lifespan. Of course, since you placed the swap partition on the HDD I guess the SSD is safe, but redundant nonetheless. Maybe you should research it and give us your feedback on this. 2) A FAT partition has a disadvantage that is a deal breaker for me. You can't use it to store a file larger than 4 GB. May not affect other users, but such limitations bug me. 3) I assume we have to go through the boot order management in your previous guide. Also, I found managing the installation of efi partitions complicated and different guides don't seem to have a consistent way of addressing it. I would like to hear your thoughts on this. VERY useful on my Y700, BUT, any chance you could format it so that the images are large enough to be read when printed? Would be great to have a hard copy of this to reference.